Havana, Cuba – there is no place like it. Is it the landscape, the architecture, the people, the music, the art? It’s all that and something else more intangible. It’s the soul of Havana. It’s everywhere. It’s in the music and art, it’s in the way the locals talk, it’s in the thick, humid air. Havana has an arresting beauty that peeks through the decaying buildings and crumbling sidewalks. It’s a city figuring out the new, while surrounded by the old. This tension is palatable; you can taste the change in the air. It’s exciting! My family visited Havana, Cuba for 4 days. It was a quick trip from Miami. We didn’t see everything, but we saw a lot. We experienced the culture, saw some landmarks, ate good food and spent time with some friendly Cubans. We loved Havana. 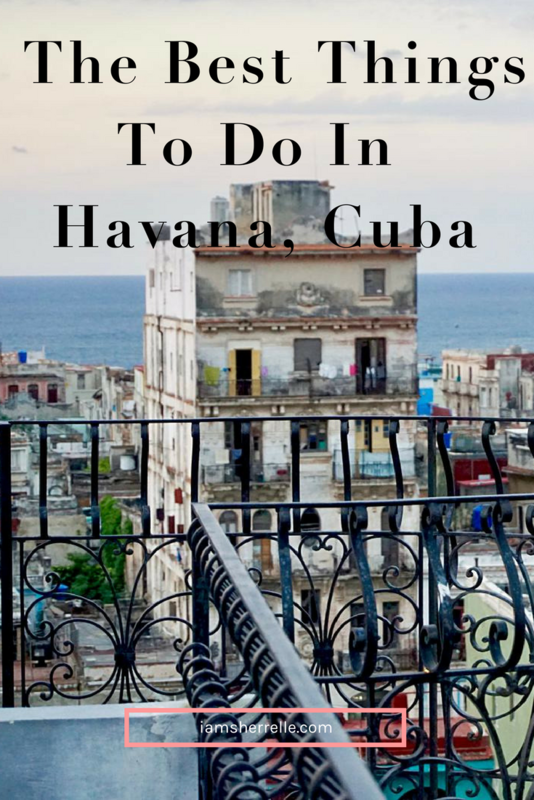 With this list of the best things to do in Havana, Cuba I guarantee that you will love it too. Take a salsa dance lesson. 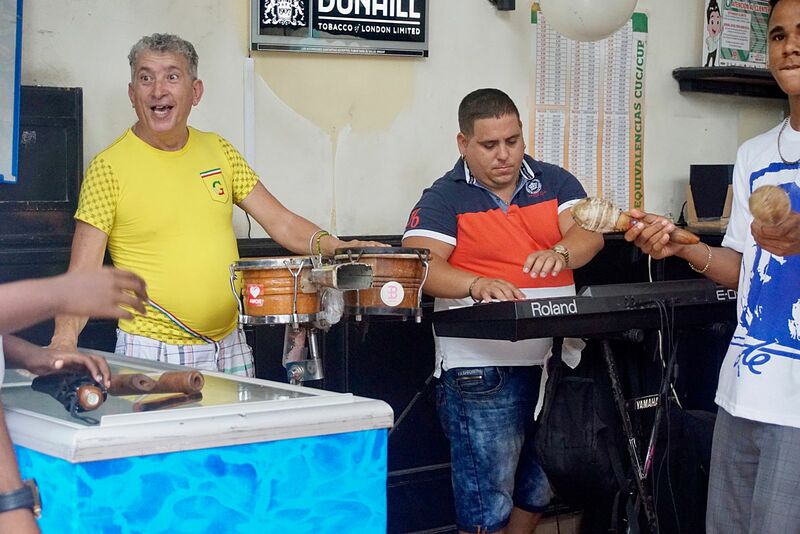 Havana is music – it’s everywhere you turn. And that music makes you want to move! We took a private salsa lesson at La Casa del Son and it was so much fun – and comical because we didn’t know what we were doing. Salsa dancing is much harder than it looks! There are subtle nuances (proper posture, small movements) that make all the difference between a graceful rhythmic dance and stepping on your partner’s feet. My daughter was a natural, my son and I were earnest students and my husband, well, let’s just say that he had good intentions. By the end of the hour we were soaking wet, sore and happy. 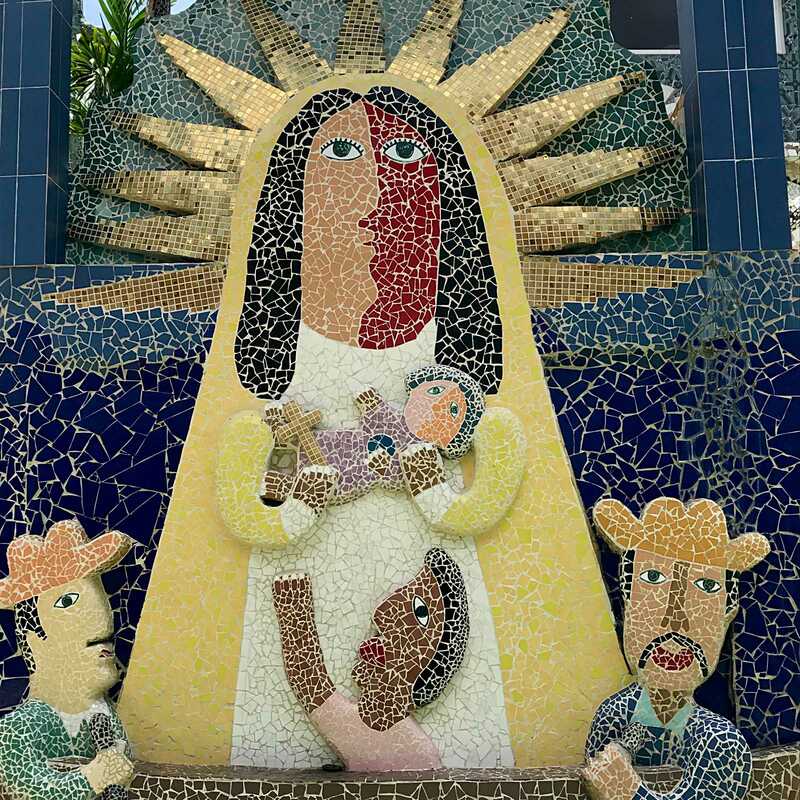 Cuba has a very robust art community in both performing and visual art. Our travel agent arranged for us to attend a dance performance, Lizt Alfonso Dance Cuba, at the Gran Teatro de La Habana. First of all the Gran Teatro is stunning; it has been restored to it’s original splendor. We had perfect box seats, but the way the teatro is constructed there didn’t seem to be a bad seat in the house. And the dance performance – I really can’t describe how amazing it was except to say that it was one of the best performance that I have ever seen (and I’ve seen many world-renown dance troupes). The live band, the dancers, the choreography – it was all top rate. Even more astonishing was that this first class performance was only the equivalent of $30USD. Unbelievable! We spent time in the Bellas Artes Museum, a well-designed open and airy space that houses the Cuban Fine Art collection. It was a pleasure to walk around and view the vast and varied art collection. There was a wide range of artistic styles, but I found the contemporary art particularly interesting and visually appealing. 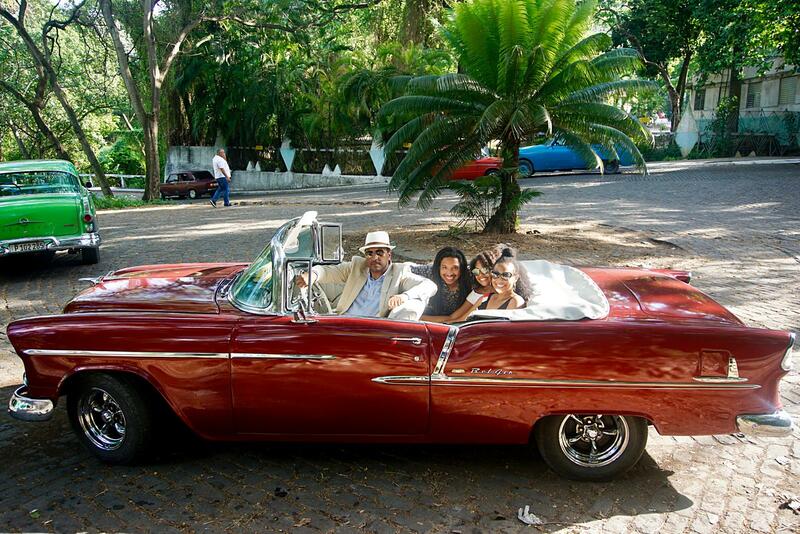 Take a classic car ride through Havana. Our car ride was arranged through our travel agent, but there were plenty of classic cars for hire in Old Havana on Paseo del Prado. Our driver was fantastic and took us on an hour ride around the city, along the Malecón and we stopped for a bit in the Havana Forest for photos and a brief walk around. 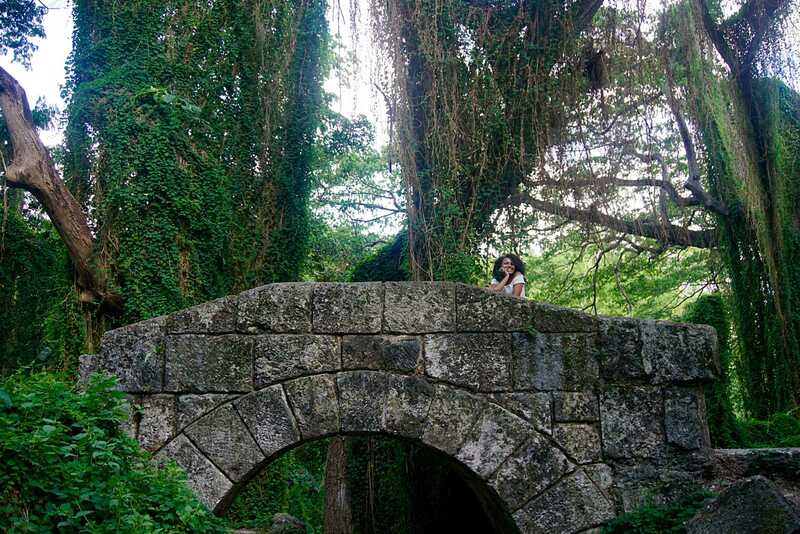 The lush trees and the Almendares River are other-worldly. Santeria rituals are often performed in the river (we saw one), even further adding to the mysterious feel of the forest. 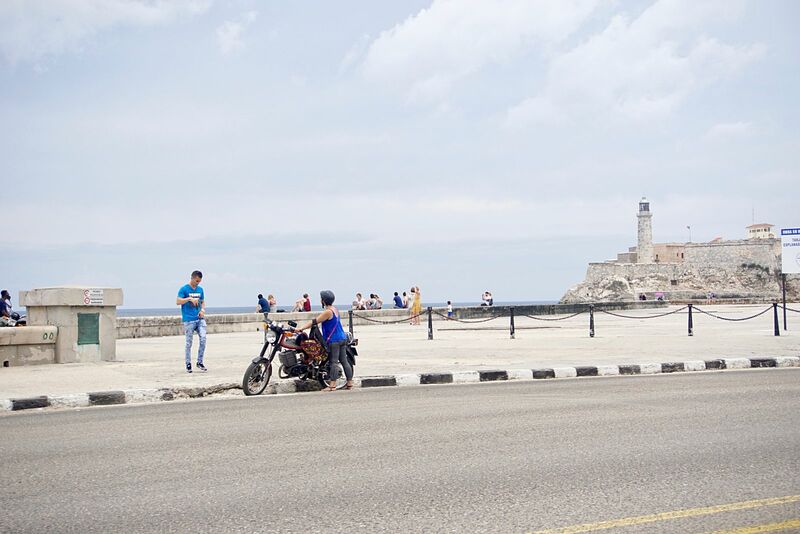 The Malecón is more than just the strip along the water, it’s the living room of Havana. Locals stroll the along strip or sit on the seawall. They talk, strum guitars, date, drink, hang with friends and generally enjoy each other and the sea air. The sunsets are spectacular. Visit Callejon de Hamel (even better on a Sunday). 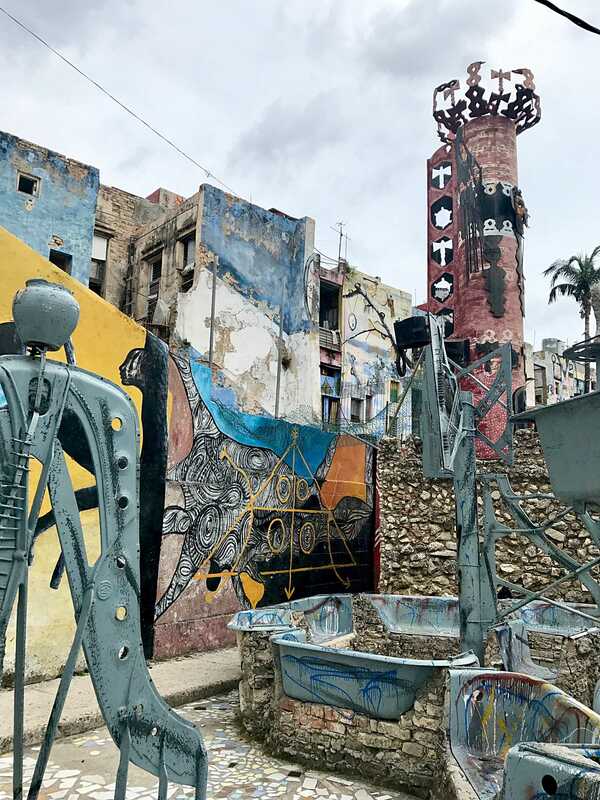 Callejon de Hamelan is an alley covered with Afro-Cuban religious-based murals and sculptures. 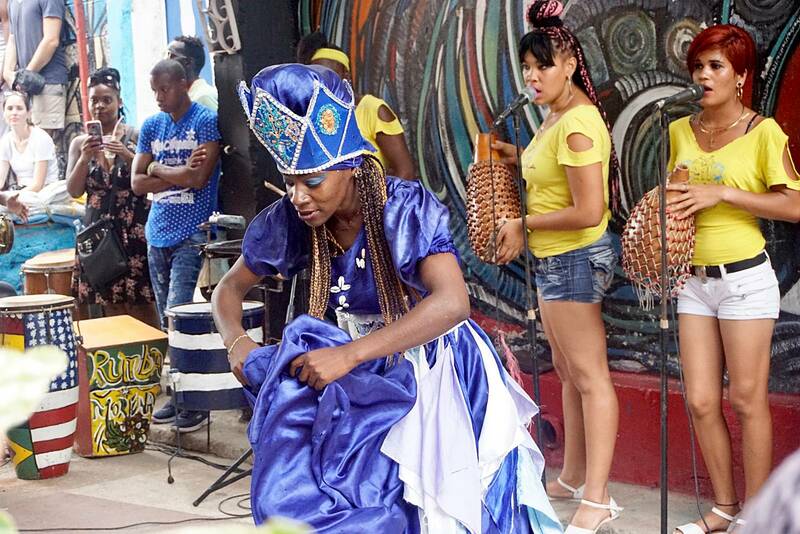 On Sunday afternoons there is a free Afro-Cuban drumming and dance performance that is a must see. It’s hot and crowded, full of both tourists and locals, but it’s worth it. Tip: If you take a taxi, have your driver wait for you. We did not and it’s hard to catch a taxi here; we had to walk very far to a main road to find a taxi. 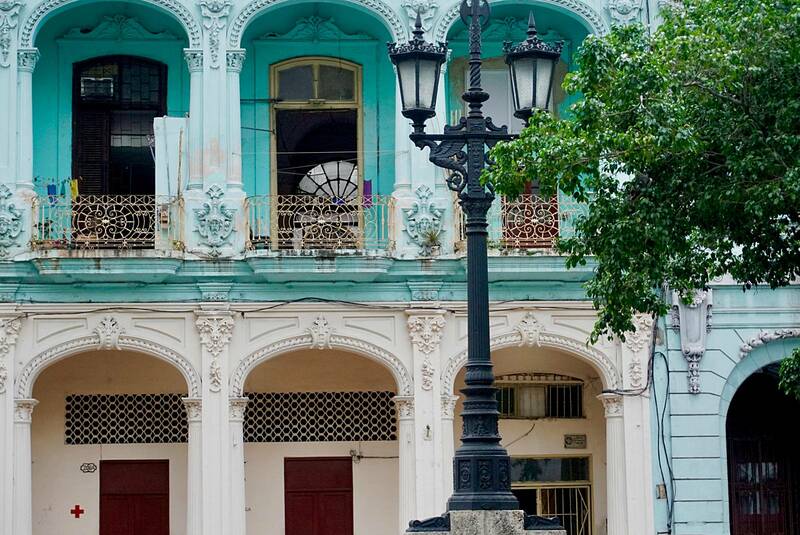 Take a walking tour of Old Havana. 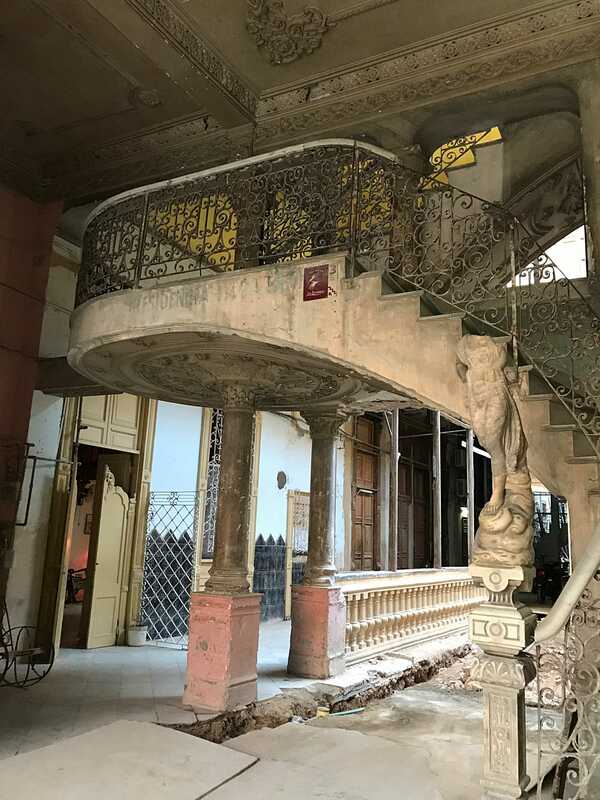 We toured Old Havana with an architect who spoke about the history and architecture as well as the restoration work taking place in the area. It was fascinating to see the old and new Havana in flux. We visited all the major plazas and stopped by the famous bar El Floridita for a daiquiri – it’s very touristy because it was Hemingway’s favorite bar. 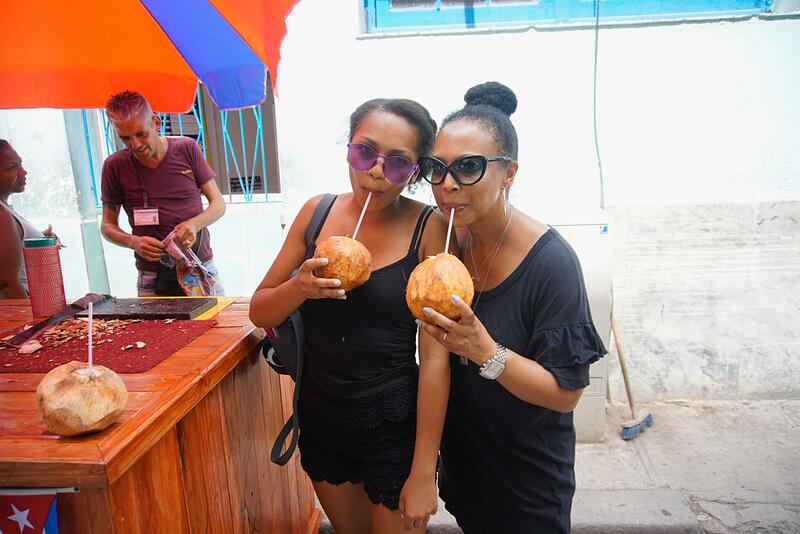 Dancing to Cuban music as we passed the bars and restaurants kept us hot while street vendors selling fresh coconuts kept us cool. Buy some Cuban art and souvenirs. The San Jose Crafts and Souvenir Market is a popular stop for tourists; it’s near Old Havana and the port, where the cruise ships dock. I found it chaotic and many of the stalls sold the same thing, but it’s a good place to buy souvenirs. You can and should bargain. My daughter bought a leather backpack and they even personalized it with her name. Back home in the US she still carries it everywhere and gets constant compliments. The leather has softened and looks even better now. I bought an original pen and ink drawing on handmade paper. The ink used is made from cigar tobacco; I thought that was unique. I prefer to shop in local boutiques when traveling and we found two good ones. Libreria Venecia is a tiny bookstore with Cuban books as well as some great Cuban posters for sale. I bought a fantastic limited edition print of Mick Jagger wearing an afro. This print was made to commemorate the first ever 2016 Rolling Stones concert that attracted 1.2 million fans. Clandestina, a cool design shop in Old Havana owned by designer Idania del Rio, sells posters, t-shirts, and vintrashe (turning 2nd hand clothing into one of a kind unique clothing and bags). I bought a tote bag that used to be a feed bag from the owner’s uncle’s farm. Vista Mar – a paladar (the restaurant used to be the 2nd floor family room) with a patio right on the water, the view is fantastic and food as well. Ivan Chef Justo – this tiny upstairs restaurant walkable to the Gran Teatro (we ate here before the dance performance) had the menu on a giant chalkboard. Esto No Es Un Café – this small cafe right off a major square in Old Havana is very unassuming but was one of the best meals that we had in Havana. I had a seafood stew that was flavorful and fresh. 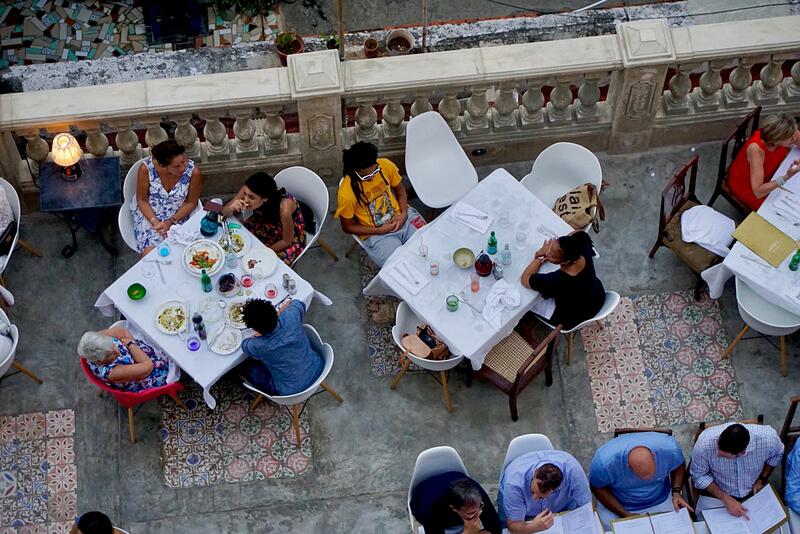 El Del Frente – this hip new restaurant in the heart of Old Havana was hard to find. It’s on a small street that doesn’t look like it would have a hip restaurant, but a walk upstairs revealed a space that could have easily been in a NYC trendy neighborhood. With a bar, a few tables and a rooftop patio, the atmosphere was fun and the food very good. We ate inventive tacos and drank the best mojitos ever. Café Laurent – this paladar is on the rooftop of an apartment building so as you walk up, you pass the doors of residents. Even once in the restaurant it still feels like an apartment, save for the tables and chairs on the patio. La Guarida – is Cuba’s most famous and charming restaurant. Upon arrival we didn’t even think we were in the right place, but the security guard in front confirmed that we were. Still doubting as we climbed the stairs through an apartment building that was once opulent but now crumbling, once we made it to the top, we understood. The restaurant is beautiful and the atmosphere on the patio is magical. 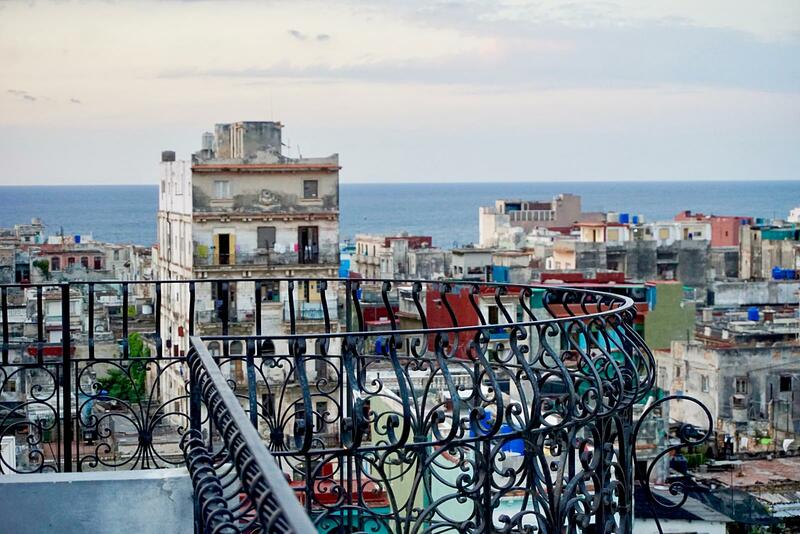 There is a rooftop bar that has a sweeping view of Havana. It was our most memorable meal. Tip: Make reservations and always ask for patio or deck seating. The restaurants are tiny, don’t seat many people and the good ones fill up fast. We saw people turned away who did not have reservations. It may be possible to make reservations online before you leave or call when you arrive (our travel agent made our reservations). This is the unofficial name of the home and neighborhood of renowned artist Jose Fuster. 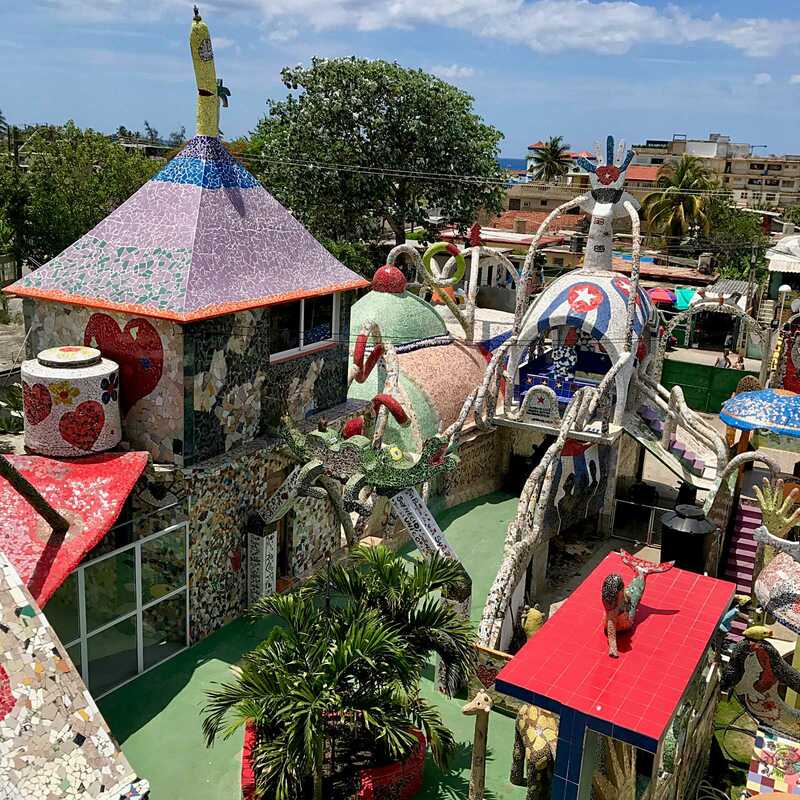 Inspired by Gaudi and Picasso, Jose has turned his home and neighborhood into a Mosaic paradise. It’s quite wonderful. Have a drink at the Hotel Nacional. It will be the most expensive drink that you will order in Havana, but this historic hotel is worth a sit-down in the beautiful garden over-looking the ocean and Malecón. After you’re done enjoying your mojito in the garden, take a little stroll to the far right corner and look for signs. 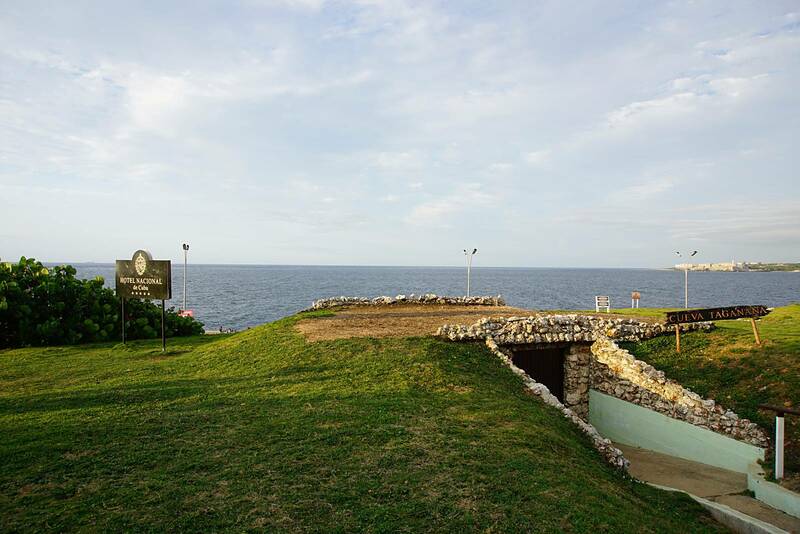 There you will see the tunnels where the Cuban Missile Crisis missiles were once set up and aimed directly at the U.S.
Cuba is wonderful to visit, but not without some prior planning and knowledge. Here’s a few things to know before you go. Cell phones – Your foreign cell phone carrier will not work in Cuba so be sure to print any contact information that you may need and download GPS maps to use off-line. Our travel agent gave us a cell phone to use during our stay and it did come in handy to call for a taxi or to call her if we needed something. Wifi – There is no free wi-fi. Tourists can buy ETECSA prepaid wi-fi cards at special kiosks for $2 – $3 per hour of service but service is slow and unreliable. We did not use wi-fi and – gasp! – stayed unplugged our entire trip. It was nice. Cash only – There is no infrastructure to accept foreign credit cards for payment nor banks with ATM machines for foreigners to use. That means that you will bring all the cash that you will need for your entire trip – and even more than you think you may need, because if you run out of cash there is no way to get more. Yes, this means that you will travel with possibly thousands of dollars in your pocket. Cuban money – Tourists use Cuban CUC (“kooks”) and they are exchanged and used only in Cuba. That means that you must either use all your CUC while in Cuba or exchange them for your home currency at the airport before leaving. It’s safest to exchange money at the airport or a big hotel with a change bureau. Tip: There is a hefty % charged for USD to CUC but none for euros to CUC, so it might be worth doing the math to see if it makes sense. Public restrooms – Always have change for the people taking care of public restroom; they keep it clean. In some places they also give you toilet paper and towels to wipe your hands after washing. I found this to be true even in fancy places like the Gran Teatro and Bellas Artes Museum. It’s not a bad idea to carry some toilet paper or tissues yourself; it’s not certain that there will be toilet paper in a restroom without an attendant. Taxis – Taxis were easy to find in heavily populated areas, but always negotiate a price before entering the taxi; write it on a piece of paper if you have to. Sometimes there is a guy who hunts for passengers and brings them to the taxi; if so, negotiate with him. Those old cars with self-employed taxi drivers? Charming at first glance but not so much while riding in them with the exhaust fumes and questionable mechanics. During one taxi ride our driver jumped out the car during a traffic light and topped off his radiator. After one too many taxis like this we resorted to calling a yellow taxi driver to pick us up. Our housekeeper gave us his card. He didn’t speak English but his wife did, so we would call her when we needed a ride and she would then call him. He was great and I wish in retrospect that would we would have retained him for our entire trip. Tip: Hire a driver. Politics – Do not speak against the government, Fidel or Che. Just don’t talk politics at all. Cigars – Only buy cigars in cigar shops – never on the street. Language – Cubans speak Spanish. Duh! 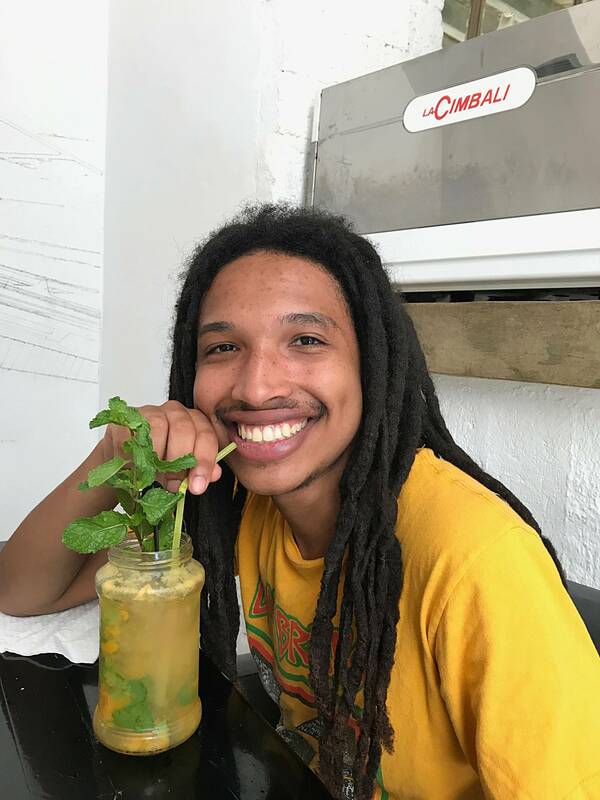 My husband thought his Spanish was pretty good – until he went to Havana and encountered people who only spoke Spanish, not a Spanish with a bit of English sprinkled in fill the gaps. Nope, they spoke Spanish only. Many times we were lost in conversation but between the four of us we managed to get around, order food and ask for directions. Despite the language barrier we spoke to as many Cuban people as we could; they were friendly and loved to talk. Most showed us photos of their families on their phones, so when words failed those photos really did say 1,000 words. There are no words needed to coo at a photo of a grandbaby. Air-conditioning – There was no air-conditioning. It was very hot. I carried a fan and I used it. Foreign Entry – You need a visa to enter Cuba and furthermore US citizens need a “reason” because straight tourism is forbidden by the US government. Many US citizens find other ways to visit Cuba, as part of a cruise ship itinerary or from another country. Accommodations – Airbnb is now available in Havana – and for a much desirable price than the hotels. 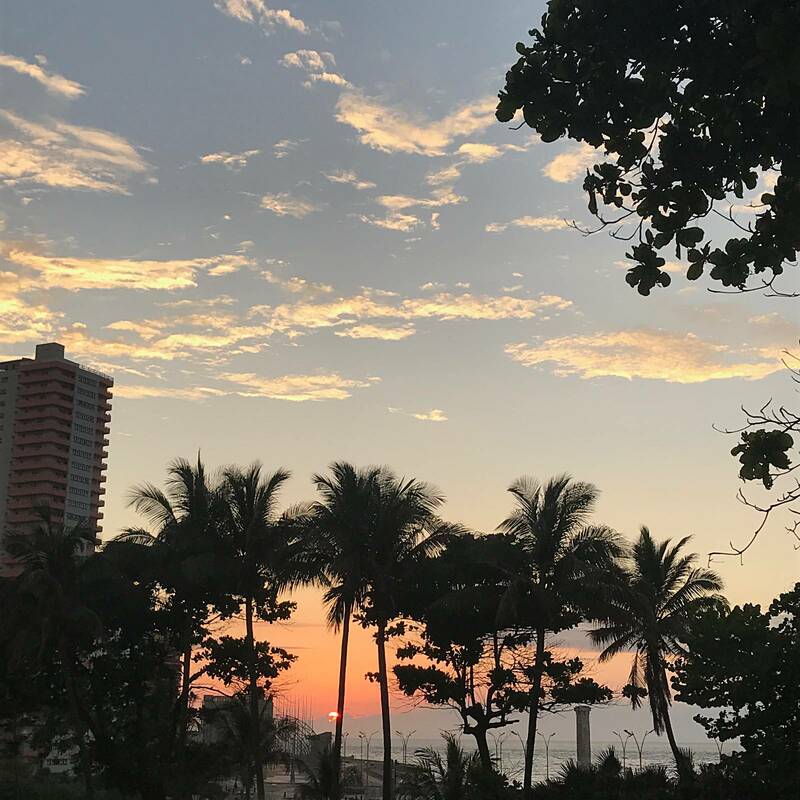 We stayed in an Airbnb apartment in the residential neighborhood of Vedado. Conversing with the owner through Airbnb was easy and payment in USD on the website meant that I didn’t have to bring cash to pay for accommodations. The apartment was on the top floor and was nicely decorated with a living room, three bedrooms, two full bathrooms, a large terrace and a rooftop patio. Best of all, the rental came with a daily housekeeper and breakfast. After confirming our preferred breakfast hour, every morning our cook would enter the apartment through a side door that led straight to the kitchen. 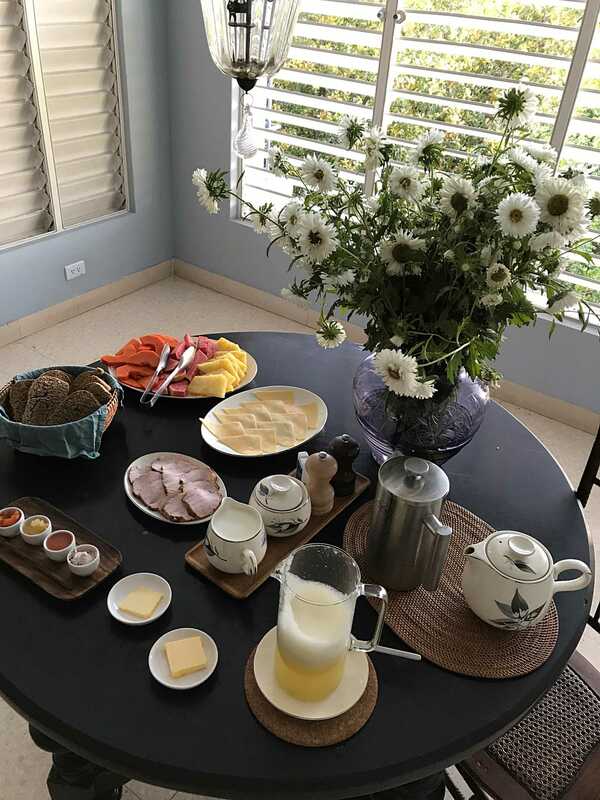 After rising we would find a breakfast spread waiting for us on the dining table and china place-settings on the terrace. It was very lovely. And yummy. Travel Agent – Consider using a travel agent or a “fixer” to plan your trip. 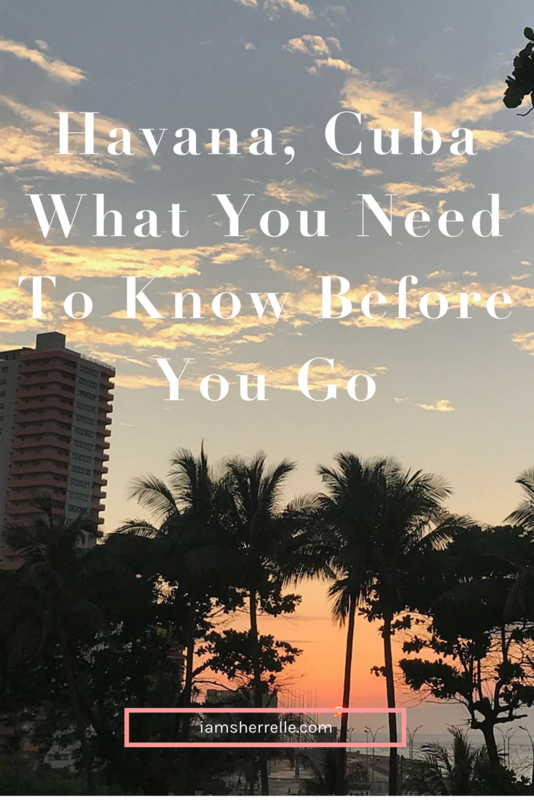 I usually plan our trips and enjoy the process, but with Cuba I knew I needed some help. A friend of a friend recommended Patricia, a “fixer” who can be a complete tour guide or plan as little or as much as needed. Since we wanted to tour Havana ourselves without a group or guide, we hired Patricia for mid-level planning. 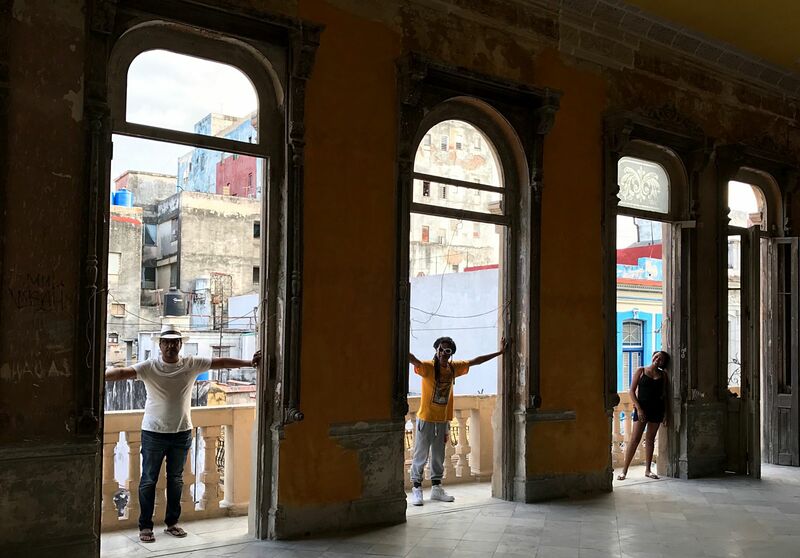 Based on our preferences and desires she planned our itinerary, suggesting both the normal tourist sites and extraordinary experiences that we would not have otherwise known about, like Lizt Alfonso Dance Cuba and our tour of Old Havana with a local architect. She helped find the Airbnb apartment, made all of our dining reservations, arranged airport transportation, gave us a cell phone to use during our stay and exchanged our money. She was on call for any issues that may arise and we did call her a few times requesting help. I’m glad that we hired her and thought it was worth every penny. 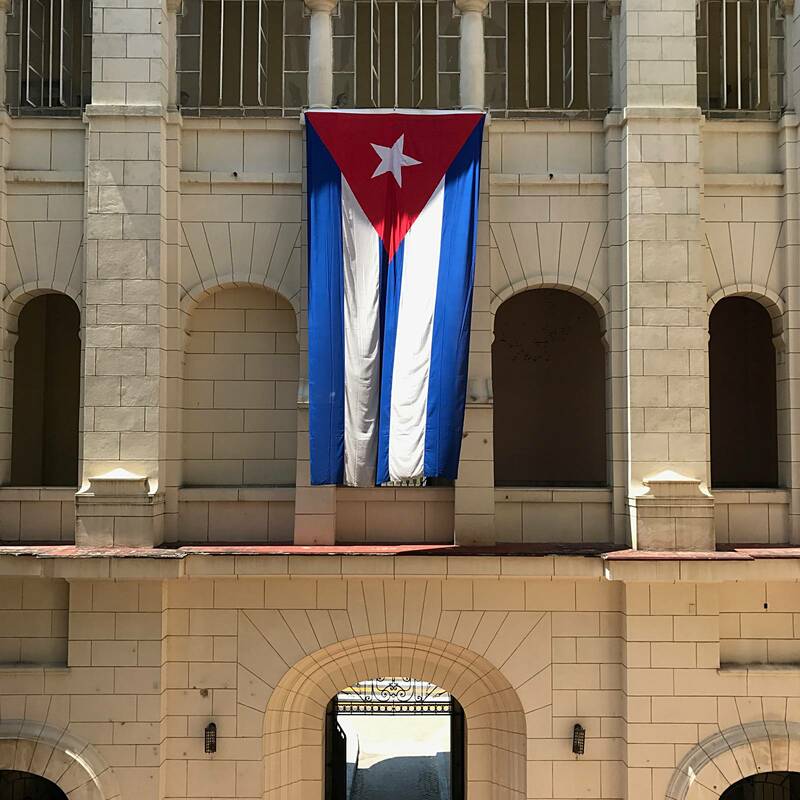 Cuban History – And finally, learn some Cuban history before you go. Read about Fidel Castro, Che Guevara, the Cuban Revolution, the Cuban Missile Crisis and resulting U.S. embargo. I found it fascinating and while I was there it made the city come to life. The interesting thing about much of Cuban (political) history is that it is not ancient history; it’s happening right now. *P.S. You may also like to read more about my world travels. *All information is true as of this writing. The regulations about entry for U.S. citizens could have changed; please check a travel government website for current regulations.